The Keycare Leadership Skills Workshops deliver a highly interactive and very unique learning experience. It takes the participants through a well planned series of interactive presentations, instructional information sessions, and small group practical workshop/break-out sessions. Keycare utilizes a very practical and 'hands on' style but within a comprehensive approach. 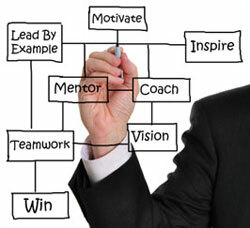 Through the Leadership Skills workshop, Keycare will increase the leadership effectiveness of your team. "Our philosophy is to use logical solutions to improve the ability of people, and consequently the organization to deliver its services successfully. Our methodology includes providing a series of coaching, facilitating, and organizational actions throughout and after the workshop." "Tom Keogh and Keycare delivered exceptional value for Canada Place Corporation. Keycare's process was an effective step-by-step progression and the final ‘product’ had many actionable recommendations. Tom continued to work with Canada Place Corporation to assist the manager’s with their planning and implementation of the action plans. In addition to providing world class business consultation, Tom took the time to fully understand our challenges. Keycare delivered on time and on budget and played a pivotal role in setting the future of our organization."